Bus from Melaka to Shah Alam is probably the most effective mode of transport for locals to travel between the two cities. Many locals rely on the direct bus service from Malacca to Shah Alam. This is because taking bus from Melaka to Kuala Lumpur requires passengers transferring city bus from Kuala Lumpur to Shah Alam. Mayang Sari and Transnasional are the only two reliable brands serving bus from Melaka to Shah Alam. Many locals like to travel with them because of their excellent bus service, affordable rate, and comfortable seating arrangement. Transnasional provides 4 daily departures from Melaka (Malacca) to Shah Alam while Mayang Sari provides 3 daily departures. The first bus service starts from morning 8.30am and the last bus leave the Melaka Sentral at 8.15pm. Mayang Sari operates the route with VIP coach. VIP coach offers spacious seat and large leg room in order for passengers having comfortable journey with Mayang Sari. The bus fare of bus from Melaka to Shah Alam is reasonably charged at about RM 15.80. 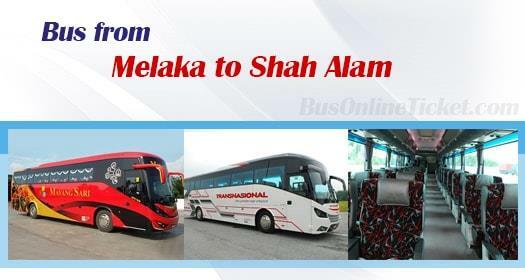 Duration required for bus from Malacca to Shah Alam takes about 2 to 2.5 hours depending on traffic and climate condition. Washroom break will be given during the journey upon request to driver during the journey. The boarding point in Melaka (Malacca) is at Melaka Sentral Bus Terminal. The arrival point in Shah Alam is at Terminal Bus Shah Alam Seksyen 13. BusOnlineTicket.com offer reliable and hassle-free online booking experience to our users. Visit BusOnlineTicket.com now and purchase your bus ticket through online in anytime, anywhere, and anyplace without waiting in a long queue.